While it’s no surprise to us (because we think horses are pretty awesome) cats really seem to have a thing for the large hoofed creatures. While it seems unlikely, it makes sense that the two would get along. The horse has no problem allowing kitty to be alpha and cats tend to be of the fearless sort. 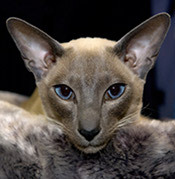 The earliest pointed cats were Siamese, although the coloring has since spread, many people erroneously assume a pointed cat is, in fact, Siamese. Today there are a variety of breeds that display this characteristic. All of the colors & patterns are based on a few basic solid colors, from there a variety of patterns & dilutions can be displayed. 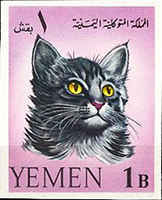 Today we are looking at pointed animals which don’t just come in solid colors, tabbies can be pointed too. Pointed animals are bright cream with colored (or patterned) face, feet & tail. We stuck to the basic solid colors here. Although not many people have seen one in the flesh, Siamese cats are among the most distinguishable breeds on the planet. Their sleek profile simply looks fit for a king. This breed comes from the kingdom Siam (which is now called Thailand) where they are thought to descend from sacred temple cats. They are a legendary symbol of good luck & thought to ward off evil spirits which meant their aristocratic profile only graced temples and the homes of the royalty. Today there are two types of the breed, one the traditional Siamese with an apple shaped head and a robust build and the modern animal with a triangular head and a lithe, slender body. We run across a lot of great videos not from searching, but from our lovely friends on the various social networks and that’s where we found this. Even if you’ve already seen it, we’re pretty sure you’ll watch it again. Ok, we know it starts slow, but this sneaky cat is worth the wait. Anyone who says that cat’s don’t have a sense of humor is sorely mistaken and has clearly never met one. For those of you who haven’t heard of Kindle, it is Amazon’s latest technology for bookworm techies – a wireless reading device. This allows readers to access to books & websites on a lightweight device that features a special screen which reduces glare and a battery that lasts a month on one charge. Because we want our readers to be able to enjoy cats anywhere they go we’ve added Felinest blog to their service for those who prefer it. The Kindle device allows users to browse and wirelessly download hundreds of thousands of titles…not to mention the over 1.8 million out-of-copyright books that can be downloaded free of charge. Photographers have long been fascinated with the feline form, it’s sleek & perfectly suited as a predator. Domestic cat is an even larger enigma, how is this perfect predator now content to sit on our laps, get fat & purr? So we wanted to take a closer look at each part that makes up the whole animal. We’ve already featured close ups of their mesmerizing (& sometimes scary) eyes, the strange comb that is their tongue & now it’s time for their pert little ears. Although cute from a distance, their ears take on a life of their own when you take a macro look at them. Thanks to the photographers who had to be pretty close to capture these fantastic shots. While it’s true we love everything tiger the most, there is just something sassy about leopard print. Although we wouldn’t know what to do with a real leopard skin (other than cradle it while we rock back & forth crying our eyes out) we absolutely adore the fake stuff. We ran around to find some of the coolest leopard ideas, accessories & gifts we could find. While we don’t recommend using them all at once (at least not all in the same room) they make fantastic & exotic accents to almost any decor. Every print idea below was hand selected by us for their sheer cool factor. For each item we’ve added a link to where they can be found on Amazon and a closer look where available. There is a huge variety of different cat colors, so many in fact that we are sure to miss a few here & there. But we wanted to bring you some of the basics, so you’ll know just by looking what color & pattern a cat is. All of the colors & patterns are based on a few basic solid colors, from there a variety of patterns & dilutions can be displayed. Today we are taking a look at bi-colored cats which always show spots of white & one other color (or pattern). There are five basic colors, black, red, blue, cream & brown. Here are examples of each bi-colored one (one or two of them are tabby’s too).